Amber, if you looky here you'll see that Argon's Instruments by Proxy GUID can be used with Atavera's instruments, which are all posted in the same thread (some updated by me, some Argon). I'd gladly update and share any additional custom instruments you have, just so I can hoard them as well! Edit: Because my keyboard has approximately 20 fully working keys. I'm not supporting it anymore since Atavera's hack hasn't been updated and the violin and synth from Freetime are broken if you use Atavera's hack. Oh, cool. Actually I've just got four items based on the piano (or grand piano? Not sure with all of them) and none are by Atavera. Thanks! Ahh, okay, I didn't know about the broken violin. Thanks for the info. Thanks Amber! I'll update these and post them in the Proxy by GUID thread when I'm done. Thank you for putting all of this together, the quality is much improved over the first extractions. The leather reward sofa is giving me a few problems which, hopefully, someone can help me resolve. First, the black frame flashes blue - I can occasionally get the frame to show black but I can't move it from that spot or the flashing returns. The second problem is the frame is not able to be recolored - I noticed when the subset section screen cam up there was only an option shown in the cushion subset; the frame subset was empty. I thought my problem may have been the result of a conflict but the above problems remain when the ls buy bundle and the ls CEP are the only CC in my game folders. Side note: One thing I found odd was the sofa recolor found in the LS Objects Recolors by Numenor & MaryLou, modified to be compatible with Argon's version download shows both recolored parts of the sofa. After further exploration, it seems that the LS CEP may be the problem Without the CEP installed the sofa frame is black but then, of course, the recolor is not available. Am I the only one having this problem? I have the 09-13-08 CEP installed. LS Reward Sofa works fine for me, with the newest LS CEP installed. Recolors work fine too, including Numenorian recolor. * Do you have the newest version of LS Buy package too? * Do you still have this problem even after you sell and rebuy the LS sofa? Argon newly created the TXMT of frame subset to make two subsets fully recolorable. * Are you sure the loading order is correct? Is LS CEP in the same folder as LS Buy bundle? As for the problem of empty subset in SimPE, it happens when the loading order is wrong. Check the loading order in SimPE preferences. The file in the first line is loaded the last. Thanks for your help. I think I may have had an outdated LS Buy package. After clearing my cache and re-downloading a few times I finally got it all to work. Thanks again. 1. The recolor of LS Reward AfricanMask (the blue one) doesn't show up in my game. 3. 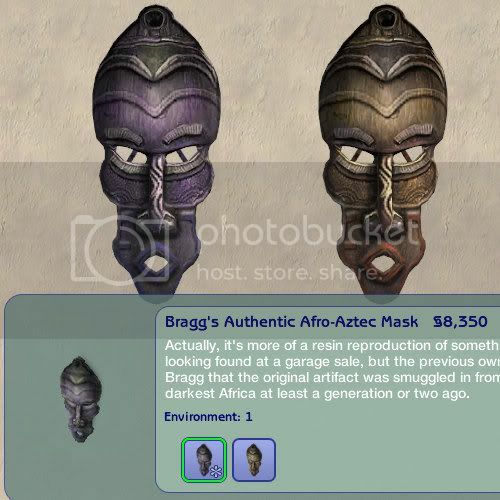 Also the price of the AfricanMask is weird, I looked in simpe and there it costs §8350 but ingame it only costs §850. 4. I think the reward rose is too expensive (§950). Numenor made his version only costs §40. The African Mask has no problem in my game. No asterisk in default color, it only shows up at Numenorian recolor which I put in Downloads. Price is correct too. Turn debug mode on and check the popup tooltip on African Mask icon. The subset should be rewardafricanmask_rewardafricanmask. If it's something else, you definitely have another version lurking in somewhere. The price of reward rose is the same as the original reward point in LS. Argon made his conversion as faithful to the original as possible. Pescado's PS conversion stove is similarly overpriced, topping 20000 Simoleons. You may have Devilsrope CS African Mask, it is actually the same mask but with change of price. LS costs §8350 and displays "Environment" 1, CS costs §850 and displays "Environment" 8. Both have the same GUID, so CS is repalcing LS. I had the same problem but I assigned a new GUID to CS mask and used repository technique. If you want I might share my version. Oh my.... Yes I have Devilsrope's Rip-offs. Mmm I don't know if I want a ceaper copy of the mask. What are the differences between them except for the environment-thing? I thought about the price and I think, although it is really unrealistic high, most of my Sims have a lot money that they can't spend. • Price (CS costs §850, LS costs §8350). • Environment score (CS displays 8, LS displays 1). • Description and name (almost the same, you may not even notice). Also, having both CS and LS masks is the reason why the recolor doesn't show up. As CS is replacing LS, the recolor is made for LS not CS. I deleted the CS mask and found a copy of the download lamp in my downlod folder (somthing like 662b...blahblah). So now everything is fixed and works like it should. And Richief thank's for your offer, but I don't see any reason to have two copys of the same exactly thing. found a copy of the download lamp in my downlod folder (somthing like 662b...blahblah). Don't you use Clean Installer? You don't end up with garbled duplicates if you use Clean Installer. If I were you, I'd delete everything with garbled filename, just for principle. If I don't know what the hell it is, then it cannot be what I wanted in the first place. Sure I use Clean Installer, but I have no clue where I get this file. I have a few more packages of this typ (maxis official download objects - all from the exchange). Maybe I should get rid of them too! Just noticed a bug with the pool table, the left side of the mesh is in the wrong group and there is also an unused group. Ok fixed the Table redownload please. I'm not sure if this has been asked about before. Why can't I click on the Reward Guitar to open the pie menu or have to click on the amplifier instead I guess there is some way to make the pie menu available both by clicking the guitar and the amplifier. Instruments by proxy GUID fixed that a long time ago, just make sure it loads after ls_buy.bundle (see the part about the bins folder on page 1). Ooooh, I just checked my Downloads folder and found I still have some leftover Numenor SSN Guitar Hack... Maybe that's all coz of that! The guitar is now working well!!! Thx, Argon! I apologize in advance if I am putting this in the wrong place, but I have a question and wasn't sure where it should go. First of all, thank you for making these wonderful Life Stories objects EP-compatible and also for doing such a good job with them. They work fine in my game, and I love the fact that they don't have a custom star, which is as it should be, since they are Maxis-made originally. However, I've been trying to add the recolors and the CEP to my game, but no matter where I put them they won't show up. I read the whole thread, and first put the objects and the CEP together in the same folder in the bins section of the Freetime folder. Then I put the recolours also in the same folder. This didn't work, so I tried moving the recolors to the Downloads folder. Then I tried moving the CEP to the downloads folder, after that didn't work. I moved the CEP back to the bins folder, and then tried the recolors in another bins folder -- still didn't work. I've now tried both the recolors and a second copy of the CEP in a variety of different places, and no matter what I do I can't get them to show up. Can anyone tell me what I'm doing wrong, and what I should do next? Thank you in advance for any advice you may have. Lord Darcy tells you what to do in this post. "Put LS CEP in the same folder as ls-buy.bundle.package, whether in Downloads, Bins or Store folder. LS CEP must be loaded after ls-buy.bundle.package. (Hence the z prefix in the filename.)" But that's the very first thing I tried, with no success. I assure you that I read the whole thread very carefully, and especially that particular post. The CEP is in the same folder with the ls-buy.bundle.package. Now, it is also in its own folder (called "LS CEP"). Could that be the problem? Should the CEP not be in a folder but be loose with the bundle package? If that's not the problem, then I have no idea what I am doing wrong, since I followed Lord Darcy's instructions carefully. Try applying the design tool. If you don't get "This object is not designable" message on LS reward objects, LS CEP is working. Note that LS CEP was expressly made for Argon's version. Any recolors you might have made or downloaded for Numenorian version will not work. You'll need to fix recolors yourself. I uploaded the fixed Numenorian recolors in that post. Also make sure that you don't have any duplicates lurking in your Downloads folder. Looking over the history of this stuff, I can't help but notice you appear to have reduplicated and then wrestled with the LS Riley Coffeemaker, mentioning something about the missing coffee grounds...except that the Awesome version has always worked. What exactly does this new version offer that makes it better? Because if it doesn't offer the actual super-coffee effect, it's basically worthless and reduced to a restrung recolor of the original base game crap coffee. If you've already done everything better, then I will simply discontinue the existing version, and if you haven't...why are you bothering to produce shoddy merchandise to be peddled off as "proper"? There should, obviously, be a single, unified, superior version, whoever produces it. As the rule here goes: There can be only one.